For the past several months, Students for a Democratic Society (SDS) chapters across the country have led protests against Republican presidential candidate Donald Trump. Anyone who has been following Trump's campaign has seen examples of the war mongering and racist policies he supports. Deporting over 11 million undocumented immigrants, building a wall on the US-Mexico border, banning Muslims, and carpet bombing Syria are just a few examples of what Trump is trying to accomplish. SDS is anti-war, anti-racist, and supports legalization and tuition equity for all undocumented immigrants. It would be against everything SDS stands for as a progressive student activist organization, to not challenge Trump’s agenda or encourage people to stand up and fight back! Donald Trump's right wing populism has become a rallying point for anti-immigrant, Islamophobic and white supremacist violence. Donald Trump’s refusal to condemn the KKK as a white nationalist organization, which was formed to attack the democratic rights won by African Americans through struggle, being an example of this. Trump’s campaign also has the support of Jean-Marie Le Pen, the founder and former leader of France's far-right National Front party, which campaigns mostly on anti-immigration policies. Overall, Donald Trump’s proposed state policies are against the interests of workers, people of color, women, and LGBTQIA+ people, while also supporting Wall Street’s wars abroad from Latin America to the Middle East. In response to Trump’s statements and calls for attacks on oppressed people, SDS has mobilized campuses and communities to express their disdain for Trump and his aspirations. 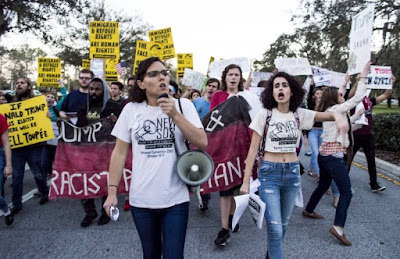 SDS chapters in Tampa, Florida, Tallahassee, Florida, Houston, Texas, Minneapolis, Minnesota, and West Chester, Pennsylvania, have organized several events in the form of “Dump Trump” protests, rallies, and piñata bashes, which have garnered the support of hundreds and thousands of people. SDS’ affiliates, such as the Progressive Student Union in Arlington, Texas, have also organized against Donald Trump and his bigotry. SDS in Chicago, Illinois, and Milwaukee, Wisconsin, have co-hosted events with the aim of opposing Trump; SDS even took a role in organizing the Dump Trump protest in Chicago last week, which saw over 5,000 people demanding an end to systemic oppression and Trump’s support of it. This event caused Trump to cancel his Chicago campaign appearance, and subsequently flee the city. SDS is nonpartisan, but we believe people have a right to protest Trump’s hate speech, especially as progressive students committed to actively struggling for social change across campuses. Every #DumpTrump protest from Tampa to Chicago has shown that what Donald Trump fears most is the power of the people, not other politicians. Students and all people have the power to unite against right-wing racists supported by or part of the powerful 1% like Trump. Such actions as Tallahassee SDS uniting hundreds of students against the KKK on campus, which historically received support from the U.S. government including the FBI and police departments, illustrate this fact. SDS is committed to leading campaigns that struggle against University Administrations, who are the 1% on campus that profit from systemic oppression, and who allow Trump’s hate on campus grounds!